Built in the early part of the Twentieth Century by Jamshed Tata, India's first five star hotel. Taj Mahal Hotel and Tower is a Hotel (Atithi-Griha) located in a historic building in Apollo Bunder, Colaba, Mumbai. It was the first building lit by electricity in the city of Mumbai (then called Bombay). Built in 1903, the hotel is an architectural marvel and brings together Moorish, Oriental and Florentine styles. Offering panoramic views of the Arabian Sea and bay, the hotel is a gracious landmark of the city of Mumbai, showcasing contemporary Indian influences along with beautiful vaulted alabaster ceilings, onyx columns, graceful archways, hand-woven silk carpets, crystal chandeliers, a magnificent art collection, an eclectic collection of furniture, and a dramatic cantilever stairway. The 1970s saw the addition of the Tower block, which nearly doubled the Hotel’s room inventory and added to public areas and F&B outlets. With its arched balconies topped by a jagged diadem, the new wing stands in harmonious contrast to the Heritage building. The Tower wing was conceived by Melton Bekker, a renowned American architect. The interiors of the Tower wing were conceived by Dale Keller, a Hong Kong based Swiss designer who ensured that an ‘Indian-ness’ manifested itself in the new building too with detailing like a relief panel in Udaipur style, Tanjore pillars in the Indian restaurant and the like. In the late 1990s, the Tower wing received a makeover. Various areas were taken up for refurbishment. Rooms on the four top floors were modernized with cleaner lines, ergonomic furniture and modern communication facilities. Over the past century, The Taj Mahal Hotel and Tower, Mumbai has amassed a diverse collection of paintings and works of art and is a veritable showcase of artifacts and art of the era. The hotel has two wings, the original The Taj Mahal Hotel (Old Wing) and the newer Tower (Multi Storied structure). 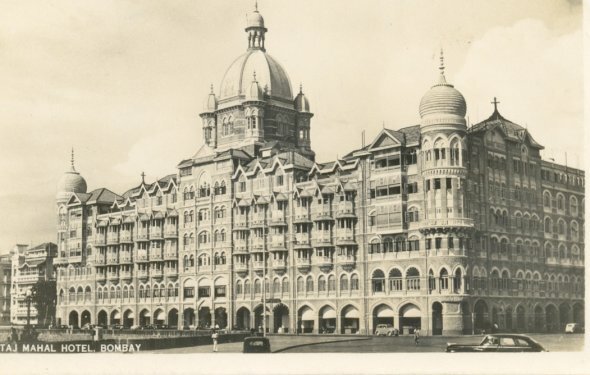 The hotel was commissioned by Jamshedji Tata and first opened its doors to guests on December 16, 1903. The original Indian architects were Sitaram Khanderao Vaidya and D N Mirza, but the project was completed by the English engineer W A Chambers. During World War I, the hotel was converted into a 600-bed hospital. The hotel is the most famous in India, and boasts a distinguished list of former guests including Mick Jagger, Prince Charles, Bill Clinton and Jacqueline Onassis. Currently, the hotel is owned by Taj Hotels, one of the most successful Luxury Hotel & Resort chains in India. On 26 November 2008 the hotel was the scene of one of 10 simultaneous terrorist attacks across Mumbai (Bombay), India's financial capital and largest city. At least 150 people were confirmed dead, and at least 327 were injured. Attacks took place in South Mumbai, at the crowded Chhatrapati Shivaji Terminus (CST) railway station; two five-star hotels, the Oberoi Trident and Taj Mahal Palace & Tower; the Leopold Cafe, a popular tourist restaurant; a hospital; and the police headquarters where at least three high-level officers, including the anti-terrorism chief, were killed by gunfire. Artwork Description Taj Mahal Hotel, Bombay (Mumbai).